“From Therese Marie Wagner Photography… Fiorenza & Jason are a gorgeous couple and a dynamic duo. The bride could easily be at home on Broadway with her powerful voice and vivacious personality, which paired beautifully with Jason’s sense of ease and sparkle. For their wedding this couple choose classic New York venues with touches of Parisian elegance. East Six Stationery crafted stunning letterpress invitations. The bridal party moved to St. Francis of Assisi Church on West 31st for their ceremony. After a beautiful ceremony the bride and groom excited the church with a fan fair of ribbons and the twinkle of bells stopping only for a brief kiss. We just loved the fanned letterpress church programs that East Six designed. 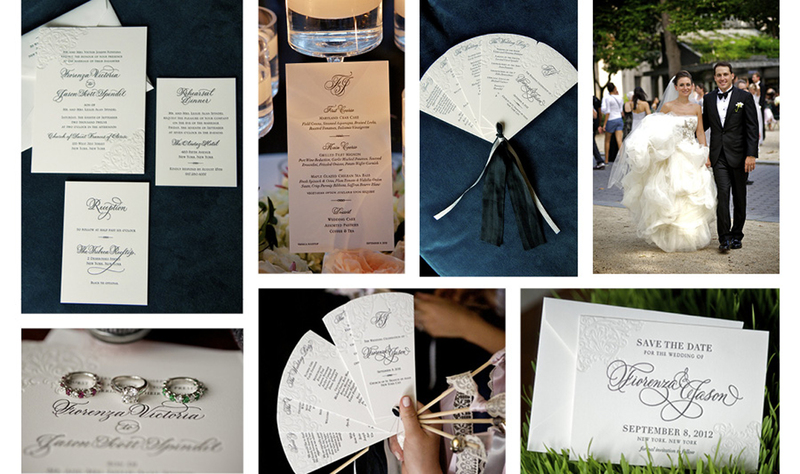 Featuring Fiorenza & Jason’s letterpressed save the date, invite set, fan programs and menus.